The Egyptian Mau is often considered to be one of the most beautiful cats around, but how do you take care of them? We’re here to discuss what you need to know about the Egyptian Mau cat. How much does a Egyptian Mau cost? Do they need a certain level of care and attention? The Egyptian Mau is quite the family-oriented cat. It loves to sit in laps, play with people, and to be pet. It’s one of those cats that really loves the attention of its family, to be worshipped per se. It does not particularly enjoy strangers, but it certainly loves its family. The Egyptian Mau is a fairly energetic and playful cat, although its play is always related to hunting. It enjoys having toys thrown for it for retrieval, and on that same note, it absolutely loves hunting for prey. It’s actually known as being the very fastest domesticated cat alive today, with a top speed of 30 miles per hour. This is also one of the rare cat breeds that enjoys playing in water, making a mess in the sink, the tub, or with his water dish. There is quite a debate about the history of the Egyptian Mau. It is assumed that this cat has its origins in ancient Egypt, literally thousands of years ago, although there is no definite proof of this. However, there are drawings and sculptures which would indicate that this is indeed the case. The first time it was really recorded was in the mid 1950s, when an Egyptian Mau was given to a Russian princess named Natalie Troubetskoy while she was living in Rome. The princess then moved to the United States with her Egyptian Mau and its offspring, where she began to breed these cats. The Egyptian Mau was recognized by various cat lover groups in the late 1960s and 1970s. 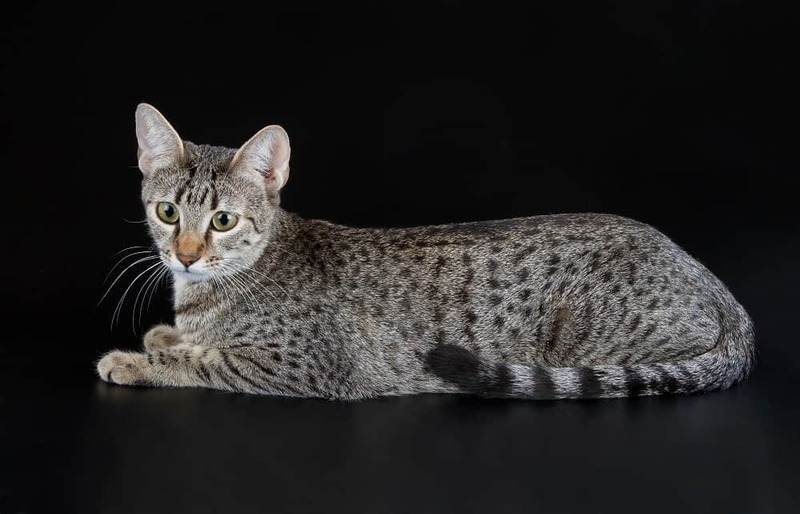 What is interesting about the Egyptian Mau is that it is known for being the one and only domesticated cat in the world with natural spots, not spots created by genetic breeding and manipulation. The world is lucky to have the Egyptian Mau, as both world wars wreaked havoc on its population size. Generally speaking, the Egyptian Mau is a very healthy cat breed. As long as they are well cared for, they don’t have many common health issues that they all share. There are some instances of heart disease, but this is not proven to be genetic. Also, if they do not get lots of exercise, they can suffer from obesity, so provide them with lots of activity. The Egyptian Mau is quite easy to care for in terms of grooming. Use a soft and simple brush to remove dead hair from their coats about once per week. Unless it happens to roll in mud or get really stinky, baths are very rarely required. These cats may sometimes develop periodontal disease, so you do want to brush their teeth on a near daily basis. Furthermore, you want to wipe their eyes off with a warm cloth a few times per week to prevent buildup. Also, use a cotton ball soaked with half water and half cider vinegar to wipe out their ears once per week. Other than that, as long as you keep the Egyptian Mau’s litter box clean, there is not much to talk about here. The Egyptian Mau is not a very big cat in terms of height. The males usually top out at around 10 inches at the shoulders, with smaller ones and females topping out at about 8 inches. With that said, these cats are quite long, coming in at about 2 feet in length. They are fairly long, slender, and muscular cats with proportionate features. The Egyptian Mau will typically grow to be around 10 pounds in weight, which is not very much. They may be long, but they are fairly lightweight cats. The Egyptian Mau is a medium-high energy level cat, so yes, they are quite active. They are very fast on their feet and can run at incredible speeds, something which they do like to show off. They love chasing toys, and they love hunting for mice and other small critters. The only time they are not running around is when they are messing around with their water bowl or any other water source, as this seems to provide them with lots of entertainment. When they are not doing either of those things, they like sitting in the laps of their family members. No, the Egyptian Mau is not a hypoallergenic cat. While they are not the worst cat to have if you happen to suffer from allergies, their dander still gets around the house. Technically speaking, it is not a hypoallergenic cat. As mentioned before, the Egyptian Mau is a very healthy cat, all things considered. This leads the Egyptian Mau cat breed to be quite long-lived when compared to other cats. On average, this cat will live for 18 to 20 years, with some being known to live well past 20 years of age. 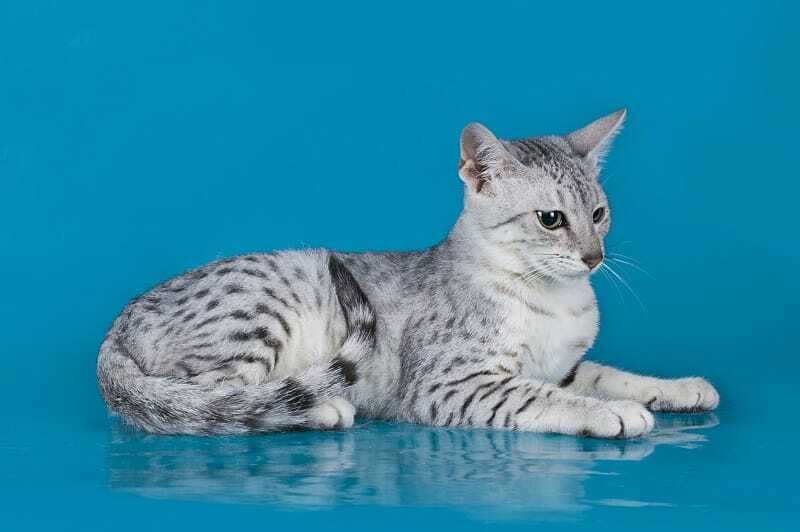 The Egyptian Mau is not overly difficult to care for, but not the easiest either. However, grooming is not a very big deal; regular brushing, ear cleaning, claw maintenance, and litter box cleaning are required. They do like to make a mess with water, they like to hunt, and they do get their paws into various objects, liking the look of destroyed toilet paper rolls and the like. They do require a fair amount of attention and lots of exercise, plus they live for a long time, so there is a certain degree of involvement in their care. Egyptian Mau cats are not very hard to find. You can find breeders in Europe, North America, and around Egypt as well. They are not all that uncommon, but we would recommend checking out your breeder before making a purchase. As long as you have a legitimate breeder, you should be fine. However, this breed can also be found in some animal rescues. Typically, your average Egyptian Mau kitten is going to cost between $600 and $1,000, but sometimes as much as $1,200 depending on family lineage. Distinguished female Egyptian Mau cats that are to be used for breeding can run you up to $2,000. One thing to keep in mind is to always check family history. Always ask the breeder about health issues with the parents and other family members further down the lineage. Other than that, as long as you have a reputable breeder, a healthy line of cats, and you find kittens with the coloration you like, there’s not too much else to think about. We have talked about how the Egyptian Mau requires weekly brushing, some ear and eye cleaning, and they need you to keep their litter box clean. You want to provide them with a healthy diet, as they have been known to get fat. You also need to provide them with means of exercise, scratch posts, and various toys which they can use to pretend that they are hunting; they love to run and hunt. Yes, the Egyptian Mau does require a fair amount of attention from family members. It can keep itself busy with toys, water, and just running around in general, but is much happier when it has family to play with. It also loves to sit in laps, be pet, and get some scratches too. They are very happy around family. These cats love to play and hunt, as running and hunting are favorite pastimes of the Egyptian Mau. They love family members, but are not overly fond of strangers. Just be aware that they will make a mess whenever there is water involved. They’re also very vocal and they will absolutely tell you when they are mad or happy too. Egyptian Mau cats are known for being the only naturally spotted domesticated cat in existence. In other words, they are all spotted, but may take on different colors. 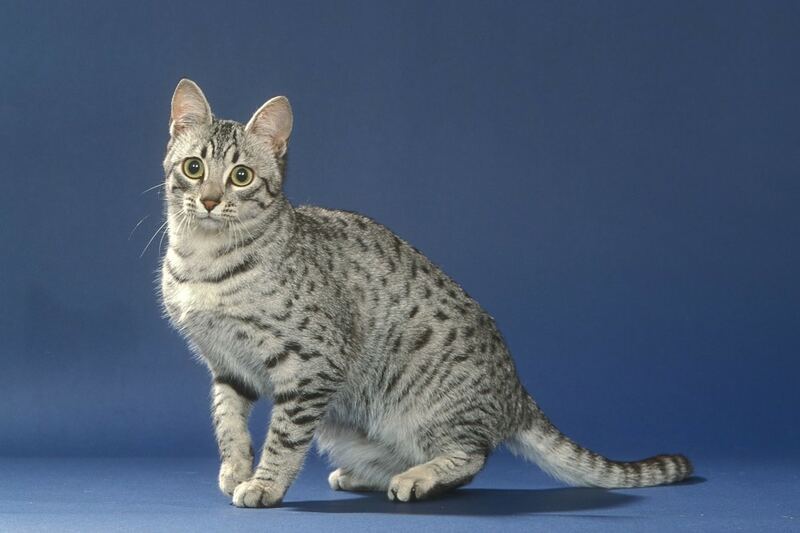 The Egyptian Mau is affectionate with family members, but as mentioned before, is not overly fond of strangers. If they know you and like you, get ready to pet them a whole lot. The Egyptian Mau, while it does not mind kids, is also not overly fond of them. Moreover, when it comes to dogs, they don’t get along all that well, although it does depend on the specific cat and dog in question. They do not do well around pet rodents, birds, and fish. Well, it’s the fish and rodents that aren’t going to do so well. The Egyptian Mau is known for being moderately intelligent, but they do seem to be more instinct-driven than anything else. They are not known for loving puzzle toys or being problem solvers. The Egyptian Mau is a moderate-high energy level cat. They will run around a lot and hunt for toys, but they do have times where they love to just hang about, especially in the laps of trusted family members. The Egyptian Mau is not all that hard to maintain, just regular cat maintenance, but they do need a lot of affection, playing, and exercise. The 3 main colors which this cat comes in includes silver, pale silver, and bronze, although they can also be black, blue-silver, blue silver, blue smoke, and solid blue. They also can have black coats with white spots, and the other way around on occasion. So, the Egyptian Mau is a fairly nice family cat, although they don’t play well with other pets and animals, and they don’t like strangers. However, they are friendly with family and they love to play, hunt, and mess around with water.